What has been true of every anniversary of the Emergency will also be of the 40th - RSS-BJP leaders will recount tales of resistance they mounted against the authoritarianism of Indira Gandhi. But what they will not talk about, or counter, are the accusations Subramanian Swamy made against their leaders in the past. In a piece for the Hindu newspaper, dated 13 June 2000, a fortnight before the 25th anniversary of the Emergency, Swamy claimed then RSS chief Balasaheb Deoras and former Prime Minister AB Vajpayee betrayed the anti-Emergency movement by writing letters of apology to Indira Gandhi. Swamy is now a member of the BJP's national executive. Indira. Gandhi, however, replied to Vajpayee, who, Swamy claimed, too wrote apology letters to her. “In fact for most of the 20-month Emergency, Mr. Vajpayee was out on parole after having given a written assurance that he would not participate in any programmes against the Government,” Swamy declared.
] Atal Behari Vajpayee and Indira Gandhi. Agency. It seems the two weren't the only luminaries from the RSS who apologised to Indira Gandhi, precisely the reason why Swamy thought it was “ludicrous” of the BJP to celebrate the 25th anniversary of the anti-Emergency movement in 2002. He even recommended to readers that they thumb through Akali leader Surjit Singh Barnala's book which provides “vivid description of other erstwhile Jan Sangh worthies who chose to walk out of prison on promise of good behaviour". (Jan Sangh was subsequently renamed the BJP). 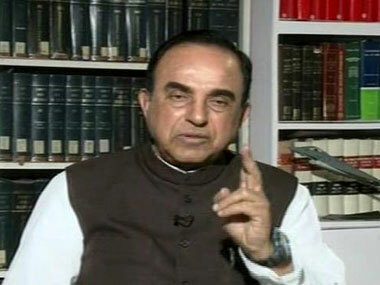 During the 1975-77 Emergency period, Swamy was an RSS insider, handpicked to represent the Jan Sangh in the Rajya Sabha. His credentials of resisting the Emergency regime are also impeccable. He was underground, crisscrossed India in disguise, and travelled abroad to campaign extensively against Indira Gandhi. He became a hero when he walked into the Rajya Sabha on 10 August 1976 undetected. When Vice-President BD Jatti was about to complete the obituary references, Swami pointed to Jatti that he hadn't included democracy in his list of recent deaths. As the MPs stood up to observe a two-minute silence for the deceased, Swamy declared he was staging a walkout - and escaped from Parliament before he could be arrested. Yet, considering Swamy's shifting political allegiances over the years, should his allegations against the RSS be taken seriously? Stories about RSS chief Balasaheb Deoras apologising to Indira. Gandhi have always been in circulation. It has been reiterated, once again, in senior journalist Coomi Kapoor's recent book, The Emergency: A Personal History. Kapoor is Swamy's sister-in-law. In the chapter, 'Swamy on the run', Kapoor says, “Ironically, Balasaheb Deoras, who was put in jail, did not play such a heroic role. From prison he sent several letters to Indira Gandhi praising her leadership, and these were perceived as a form of apology and a plea for pardon.” This echoes Swamy's allegation made in The Hindu in 2000. However, Kapoor is more sympathetic to Deoras than Swamy. She writes, “Others more kindly disposed towards Deoras argued that these letters were a tactical move meant to protect the interests of the organization and its members.” But this argument could well be a retrospective attempt to present the RSS as a steadfast opponent of the Emergency. Swamy's indictment of the RSS, in contrast to Kapoor's, wasn't confined to individuals but extended to the organisation as such. In the Hindu piece, Swamy said it was RSS leader Muley who advised him to go abroad. Why? Is there corroborative evidence to support Swamy's charge that Vajpayee struck a deal with Indira Gandhi? Kapoor says Vajpayee and LK Advani were arrested in Bangalore on 26 June. Days later, Vajpayee was admitted to the city's Victoria Hospital, where he was operated for appendicitis. This was a misdiagnosis - he had typhoid and, because of the needless operation, he developed septicaemia. Vajpayee was subsequently shifted to the All India Institute of Medical Sciences, “kept isolated on the fifth floor”. Kapoor says Vajpayee's foster family had to take recourse to lengthy procedure to meet him, involving, among other things, securing clearance from the Prime Minister's Office.
] Subramanian Swamy. IBN Live. 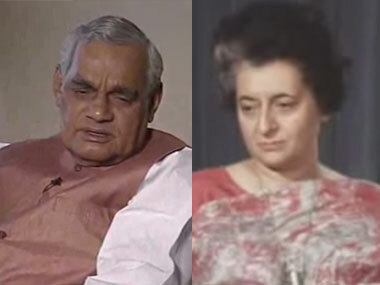 Did Vajpayee promise to cooperate with Indira Gandhi because of his understandable wish to have his foster family around? Kapoor doesn't mention the letter of apology which Swamy referred to. But she does say, “Eventually, because he was bedridden, Vajpayee was granted parole to stay at home". The mystery about Vajpayee's parole deepens even further when Kapoor discusses the Opposition leader Charan Singh's negotiations with Indira Gandhi. Singh was keen to come out of the prison, but was apprehensive that if he were to walk into freedom alone, his image would be tarnished. He, therefore, submitted to the Congress regime a list of political prisoners who he wanted to be released along with him. Kapoor writes, “Charan Singh was released in March 1976… Most of the prisoners on the list given by Singh were released soon afterwards, except for (socialist stalwart) Madhu Dandavate. BJP leader Atal Behari Vajpayee, bedridden after a slip-disc operation and suffering from septicaemia, was by this time on parole, but under house arrest.” This means Vajpayee had been on parole at least from August-September 1975 to March 1976. It is strange Kapoor shouldn't have asked Swamy whether or not Vajpayee apologised to Indira Gandhi. Not only is she Swamy's sister-in-law, her book draws on her personal interview with him. Nor is it that what Swamy wrote in the Hindu was the only time he accused Vajpayee of acquiescing to Mrs Gandhi. For instance, Outlook magazine in March 1998 ran excerpts from Swamy's autobiography, Swami and Friends-a Few Enemies Too, which was serialized in the Tamil weekly Kumudham. Swamy's animus towards Vajpayee is well known. Could he have been exaggerating the story about Vajpayee's submission during the Emergency? That's possible. Nevertheless, different accounts make it clear Vajpayee spent much of the Emergency period on parole, albeit under house arrest. Not the doughty opponent of the Emergency as he has been made out. Nor was it that the RSS remained steadfast in opposing the Emergency. Its role in the resistance against the Emergency wasn't bigger than that of socialists, without whom the movement to reclaim democratic and civil rights would have floundered. Worse, the RSS leadership seemed to have caved in to Indira. Gandhi. The Sangh's narrative of the anti-Emergency movement has gone unchallenged for a variety of reasons. One, the collapse of the Janata Party and the dispersal of socialists have prevented the creation of Emergency memories parallel to that of the Sangh's. Two, several Janata Party's offshoots over the last 25 years have aligned with the Congress, rendering difficult the task of keeping alive the memory of their own as well as their mentors' role in it. To harp on the movement against the Emergency implies criticising the Congress too. Three, the anti-Emergency movement, as political scientist Prof DL Sheth suggests, provided the Sangh an event to celebrate and mainstream itself. Till then, it had been a marginal force, having contributed little to the Independence movement and known more for its role in the killing of Gandhi. The Jayaprakash Narain, or JP, movement sanctified the Sangh. This has prompted the Sangh, with a little help from its friends, to spin myths about its own role in the RSS. Four, the party in power is relatively better placed than others to scribble its name on the milestones of the past. This truism will be on display on the 40th anniversary of the Emergency, as it was on the 25th as well - the BJP was in power then too. As BJP leaders celebrate their role in resisting the Emergency, it will be yet another attempt at scrubbing from the public memory what is inconvenient to them and writing history in black-and-white, as is their habit.